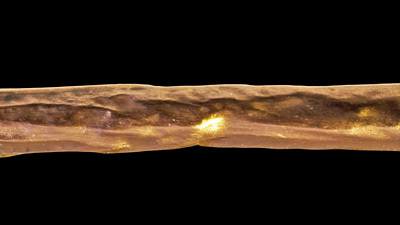 I was forced into the copper business, when a combination of recycling laws and new "improved" drawing techniques, flooded the market with cheep low grade copper. This began to force traditional plants out of business. I found an "old fashion" plant that was closing and we began slow drawing and annealing pure copper rod in inert atmospheres. Soon we were supplying most of the specialty drawn high purity metals used in high-end audio. This formula endured for two decades. Recently a series of events lead us to the ultimate knowledge and development of our most amazing metal. Most of our metals are being sold to audio related consumers, however, several non audio customers purchased them for their own unique reasons. My relationship with two of these customers and a boost from Joe Harley (AQ) led to this break through. The first clue came from a customer who we make a custom cable for. He named it Low Thermal because it was used in accurately measuring minute DC variations without temperature induced variation. At the time, we gave little thought to metal, thinking the reason for it's superior performance was low dielectric involvement. In retrospect it is clear that the conductor was a big part of the equation. We had spent considerable time working on eddy currents in the connections, this should have been a clue. The second clue was from a customer that was using miles of fine copper strand to cool micro chips in a detector used in a cyclotron. He didn't even care if it conducted electricity! We shared the most interesting set of information. He had discovered that detectors quite removed from the collider itself were responding at distance to collisions occurring in the device. To reduce the noise in detector chips they were bonding fine copper strands to the chip substrates and immersing the strands in liquid helium to cool them. But commercial copper was loosing its thermo conductivity around 40 degrees kelvin (-387.67° F / -233.15° C). He was interested in our metal for its thermal properties! As it happens, I had just developed a very cool way of looking at strand grain structure under high magnification. I thought I could see his problem in the grain pictures. After viewing them, he agreed and was willing to help me take the next step. I had discovered by ear, that short cuts in the refining and drawing of metals degraded their audio performance. I knew that pure soft metals and meticulous attention to drawing techniques yeilded a quieter strand. 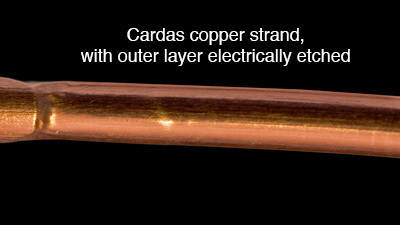 For decades we have produced the lion’s share of the copper and silver for high-end audio. I now had the opportunity to better understand the problem. It seemed both our concerns related to grain structure. I had developed methods for viewing grain structure and measuring eddy currents in conductors and now I had a new perspective from a different world and everything was pointing in the same direction. There was a correlation between low temperature thermal conductivity and inter transient noise in room temperature conductors! I was pumped. I asked my customer why he thought the thermo conductivity of some copper was superior to others. He said that thermo conductivity in metals was in free electrons predominantly until about 40degrees Kelvin. At this point the free electron supply dried up and conductivity was phonetic (vibrations directly through the contiguous crystalline structure). This made sense in many ways. What we had discovered in commercial copper was a severe shredding of the crystalline structure. Basically, charges and heat flow are scattered by impurities, imperfections, and inhomogeneous metal structure. 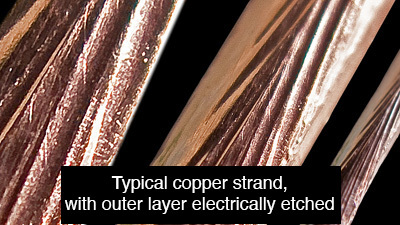 The shredding of the crystalline structure was from drawing the strand too fast and the interleaving of impurities (predominantly copper oxide). 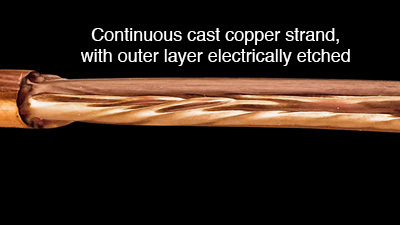 We saw that casting or extruding pure copper could change that structure. We learned that slowly drawing and annealing very pure copper resulted in less shredding and melded the metal even better. Carrying the process further, we found that using a pure steam or an inert nitrogen atmosphere, help the metal to bond during the processing. It seemed that eliminating oxygen while slow drawing and annealing produced a better structure. Once formed it seemed to self heal as long as there was no oxygen present. I decided to try somthing. We would draw and anneal even slower in a reducing (oxygen scavenging) atmosphere(hydrogen H+) to completely eliminate every trace of oxygen to allow the drawn metal to reform continuously as it was drawn and annealed. The results were beautiful! The new metal was more contiguous in the interior than on the surface. 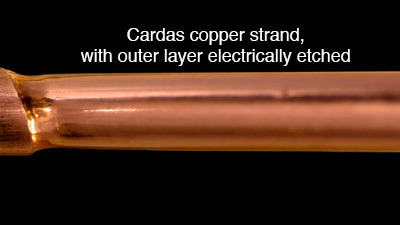 This conductor (LE) is the most grain free copper, I have ever produced for audio purposes.